Photography is something most of us practice everyday. Whether it be from taking a simple photo of your food to landscapes– photography continues to illuminate our lives and intrigue us. But how did we get to this point in technology– where it's as easy as pulling out your phone to take a photograph? Let's revisit history to see the evolution of photography! 5TH CENTURY B.C. ⇢ Chinese and greek philosophers describe the basic principals of optics and the camera. The Chinese were among the first to discover the idea of the basic pinhole camera. Around 5th Century B.C. they wrote about how an image was formed upside down from a "pinhole" on the opposite wall. 4TH CENTURY B.C.⇢ The Greek philosopher Aristotle discussed pinhole image formation in his work. 1021 A.D. ⇢ The invention of the camera obscura is attributed to the Iraqi scientist Alhazen and described in his book of optics. 1664-1672 ⇢ Sir Isaac Newton discovers that white light is composed of different colors by refracting white light off a prism. 1685 ⇢ The vision of a box form of a Camera that was portable and small was was envisioned by Johann Zahn, THOUGH it would be nearly 150 years before technology was able to bring his vision to life. 1717 ⇢ Johann Heinrich Schulze discovered that silver nitrate darkened upon exposure to light. 1816 ⇢ Frenchman Joseph Nicephore Niepce constructed a wood camera fitted with a microscope lens. He succeeded in photographing the images formed in a small camera, but the photographs were negatives- meaning they were darkest where the camera image was lightest and vice versa. They were not permanent in the sense of being reasonably light-fast; like earlier experimenters, and Niépce could find no way to prevent the coating from darkening all over when it was exposed to light for viewing. Disenchanted with silver salts, he turned his attention to light-sensitive organic substances. 1826 ⇢ Joseph Nicephore Niepce invented Heliograph, which he used to make the earliest known permanent photograph from nature, View from the Window at Le Gra. The process used bitumen, as a coating on glass or metal, which hardened in relation to exposure to light. When the plate was washed with oil of lavender, only the hardened image area remained. View from the Window at Le Gras required an extremely long exposure (traditionally said to be eight hours, but now believed to be several days) which resulted in sunlight being visible on both sides of the buildings. 1837⇢ In collaboration with Joseph Nicephore Niepce– Louis Daguerre invented the first practical photographic process, which was widely used in portraiture until the mid 1850s. The image below is one of the world's first photographic self portraits. It was taken by Dutch migrant, Robert Cornelius, in 1839 outside his family business in Philadelphia, USA. The back of the daguerreotype reads: "The first light picture ever taken". 1837⇢ The first aerial photograph was taken by Gaspard Felix Tournachon of Place De L' Etolie, Paris. It was shot from an altitude of 520 meters in a tethered balloon. 1861⇢ Scottish physicist James Clerk Maxwell produced the first color photograph in 1861. 1871⇢ Dr. Richard Maddox discovered a method of using gelatin instead of glass as the plate material for the light-sensitive solution. This discovery led to the invention of dry plate photography, a less cumbersome process that did not require the photographer to use a darkroom tent for immediate plate development as had been required by wet plate processes. 1884- 1888⇢ George Eastman introduced celluloid based film in and the small portable easy-to-use box camera. His first camera, which he called the "Kodak," was a very simple box camera with a fixed-focus lens and single shutter speed, which along with its relatively low price appealed to the average consumer. The Kodak came pre-loaded with enough film for 100 exposures and needed to be sent back to the factory for processing and reloading when the roll was finished. By the end of the 19th century Eastman had expanded his lineup to several models including both box and folding cameras. Photography could now reach the masses. 1878⇢ Eadweard Muybridge successfully captured the sequence of movement. It was this ground breaking discovery and technique that helped invented motion pictues. 1884- 1924⇢ The camera went into production at the Leitz factory in Germany. It was called the Leica from the initials of "Leitz Camera." Equipped with cameras encased in waterproof housing and pounds of highly explosive magnesium flash powder for underwater illumination, the pair pioneered underwater photography. 1929⇢ The major step forward to mass marketing of the TLR (twin-lens reflex) came with the Rolliecord and then rollieflex, developed by Franke & Heidecke in Germany. 1936⇢ The first 35mm SLR, the Ihagee Kine Exakta had a left-handed shutter release and rapid film wind thumb lever, folding waist level finder and 12 to 1/1000th second focal plane shutter. 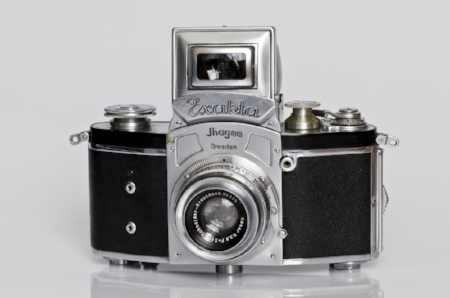 1948⇢ An entirely new type of camera is introduced– the Polaroid Model 95. It was the world's first viable instant-picture camera. The Model 95 used a patented chemical process to produce finished positive prints from the exposed negatives in under a minute. 1949⇢ A historic camera: the Contax S— the first pentaprism SLR for eye-level viewing. 1952⇢ Asahi's first model, the AsahiflexI, was the first Japanese-built 35mm SLR. 1959⇢ The nikon f— the first Japanese system camera with interchangeable components that constitutes the core of a system. 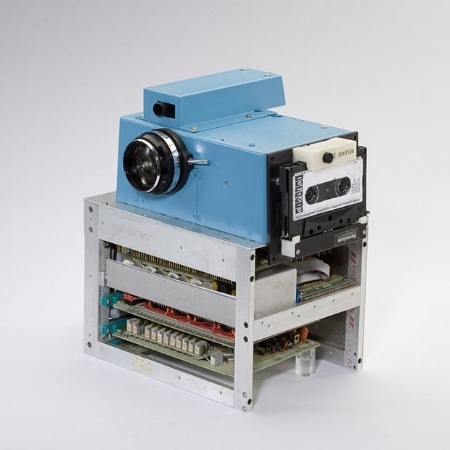 1975⇢ The first ever digital camera was invented by Steven Sasson, an engineer at Eastman Kodak. 1984⇢ Steve McCurry captured one of the most famous portraits the world had ever seen. The Afghan girl with the haunting green eyes captivated everyone. That captivation proved, once again, the power of photography to open eyes—and hearts and minds—with a single image. 1988⇢ Though it never hit the market the 1988 Fuji Fujix DS-1P introduced an important technology– a removable SRAM (static RAM) memory card developed with Toshiba. 1993⇢ Unlike many other digital cameras that stored photos in “volatile” memory that required battery power to prevent file loss– this video graphics array (VGA) resolution camera was the first to save image files in the kind of solid-state flash memory that is now the near-universal storage medium in digital cameras. 1994⇢ Generally believed to be the first consumer (under $1,000) camera to take color images on a single sensor, the QuickTake, designed by Kodak and manufactured by Chinon in Japan, captured at VGA resolution. It represented the first take on photography by Apple. This is where it all started for Apple! 1994⇢ Foreshadowing the camera phone and Wi-Fi-equipped cameras that wouldn't appear until many years later, the 1994 Olympus Deltis VC-1100 model was the first digital camera with the ability to transmit images over a phone line, without the intermediary of a computer or other device! 1999⇢ The Kyocera VP-210 introduced a concept that we still use frequently today– phone photography! It could store 20 stills and transmit live “video” at a rate of 2 fps. Sharp soon followed with its J-SH04, developed with inventor Philippe Kahn, whose 1997 prototype phone was the first to transmit a photo—of his baby daughter. Compare this to your iPhone 7 ! 1991⇢ The Nikon D1 was the first DSLR body designed from scratch by a single manufacturer. It competely changed the game for SLRS at that time- dropping the price of a digital SLR by more than half. The original price the camera was sold at just under $5,000. It offered the image quality, build, and performance that was required by photojournalists at this time. It, and DSLRs from Fujifilm and Canon, also helped end the reign of Kodak in professional DSLRs. 2003⇢ When this 6MP DSLR was announced on the Internet, editors scurried to redo the cover to trumpet the first DSLR priced below $1,000 ($999.99, street, with kit lens). The Reb flew off the shelves and proved the tipping point for countless serious amateur photographers to switch from film to digital. 2005⇢ The Canon EOS 5D had the popular new market category all to itself until 2008, when Nikon and Sony released their D700 and Alpha 900. It was Pop Photo’s Camera of the Year for ’05 provided full-frame capture to serious amateur photographers and cash-strapped pros for the first time, with a price less than half of the bigger, heavier professional full-framers. 2007⇢ The Go Pro Digital Hero 3 is introduced to the market and offers go-anywhere cams with rugged cases. Now most people who do sports, ride bicycles, even drive cars have these. 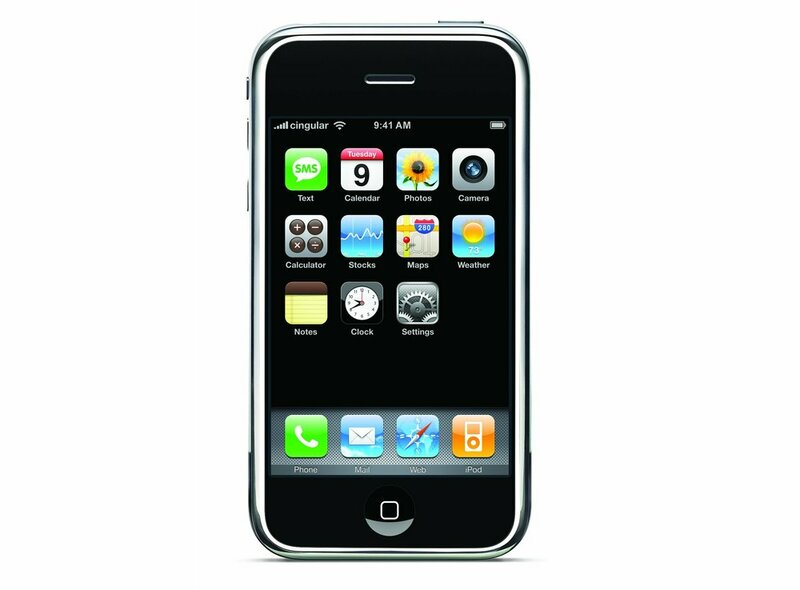 2007⇢ The first ever Apple Iphone is introduced. Though Apple was not the first to include camera phones– they combined a simple camera interface, intuitive downloading and sharing tools, and, in 2008, a highly accessible platform for third-party photo apps– making these incredibly popular. Notice the phone company provider's name is Cingular... ! 2008⇢ Polaroid announces it is discontinuing the production of all instant film products, citing the rise of digital imaging technology. 2008⇢ The Canon EOA Mark 11 is introduced. Although not the first (by about a month) to offer video on a DSLR, the quality of the video was so good that it was single-handledly responsible for kick starting the now widespread use of DSLRs in the broadcast film and TV industry, in which it has become ubiquitous. It has been widely used to shoot TV shows such as House and even for movies, in addition to its' enormous popularity among landscape photographers. 2008⇢ When Panasonic took the mirror and prism assembly out of a DSLR and replaced them with an electronic viewfinder, the resulting camera, the Lumix G1, became the world’s first Compact System Camera. Not only is this the fastest growing sector within the camera industry it’s one of the fastest growing of any consumer electronics category – it now accounts for almost half of all interchangeable lens cameras sold in Japan, for example while it’s approaching one third in Europe. The main advantage of the CSC is in offering relatively high image quality, and interchangeable lenses, in a small camera, with smaller lenses. But by casting aside the optical assembly from DSLRs the G1 also paved the way for the wide spectrum of interchangeable lens cameras we see today, from every manufacturer, which come with or without viewfinders, and with a variety of sensor sizes from DSLR sized down to compact camera sized. 2012⇢ The Nikon D800 comes to the market with an unprecedented 36 million pixel full frame sensor. 2016⇢ The Canon 5d Mark IV is relased as a whopping 30.1 megapixels full frame digital single lens-reflex with the ability to shoot video in 4k. 2016⇢ The iphone 7 introduces its latest in camera technology- a camera has a six-element lens and a 12-megapixel sensor. The camera now comes with optical image stabilization and A f/1.8 aperture that captures 50% more light means you’re going to get much better pictures and videos in low light conditions. Photography has evolved a lot over time. The question is, where will it go next? Leave a comment below on where you think photography might be heading in the future!